While i was checking the software update compliance reports for Microsoft and Non-Microsoft (3rd party updates ,SCUP integrated) ,i see that ,compliance report looks good for Microsoft but not for 3rd party updates. SCCM Version: Configmgr Current Branch 1702 with SCUP integrated for 3rd party updates. During the investigation on 1 client, found that ,it is failing to install only adobe & Java updates but rest of the 3rd party updates (Chrome, Filezilla,Firefox etc) installed successfully. Initially when i ran the software update report and compliance % was not at at good shape ,so my thinking was ,it could be because of certificate issue but after logging to the client, found few 3rd party updates installed but not Java & Adobe. So as part of troubleshooting ,verified the SCUP certificate imported successfully (double check though other 3rd party updates installed) ,AcceptTrustedPublisherCerts=1 set in registry correctly HKEY_LOCAL_MACHINE\SOFTWARE\Policies\Microsoft\Windows\WindowsUpdate. Next is to look at the client logs for software updates. The first log to look at is wuahandler.log . Failed to download updates to the WUAgent datastore. Error = 0x80246002. 0x80246002 refers to A download manager operation could not be completed because the file digest was not recognized. After seeing above error, i went to ccmcache to verify the content download was successful or not but i can see the content downloaded to ccmcache and i can extract the file (cab) to see installation file for Java. Next to look at windowsupdate.log ,even that has same error as above. All the logs have same error code “file digest was not recognized”. This could be due to the hash mismatch issue so which lead me to think about re-publishing the Java and Adobe (these 2 have issues) from SCUP to SCCM ,resync the software updates ,redownload the content ,delete the existing deployments, create new deployment solve the issue. Steps that i followed to the fix are long enough but you can give a try by simply re-distributing the content to DP ,delete the existing deployment and re-create the deployment for Adobe & java updates to see if that works for you. How did i solve the issue ? 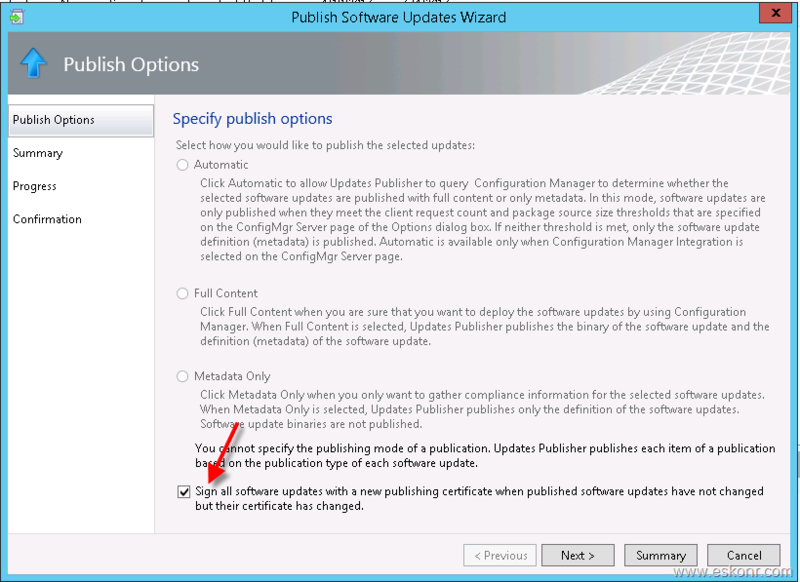 2.During the publish option ,do select the following Sign All ,click next ,next and close . Monitor SCUP.log for any errors. 4. After the sync success ,re-download Java & Adobe updates to package. 5.Delete the existing deployments because client must re-download the new package that you download now else client will follow the old content that was stored in ccmcache and it will keep failing.